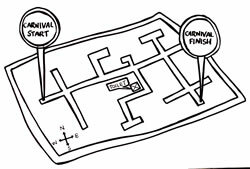 Make a carnival map to make it easier for you to follow the parade route! What was your journey like from home to the Map Factor meeting? Are they easy to understand or are they difficult to understand? What makes maps easy or hard? How can pictures show meaning? Where to sit, where to buy water, where it's a steep bit... have a go! You can make a photo map and a map with cartoons and drawings. These help give different people information in different ways. Cut and paste, no time to waste!